Believe I last updated in Austin so will start of from the next destination which was San Antonio. San An is the seventh largest city in the USA but you wouldn't think it as everything is centralized including the Alamo. 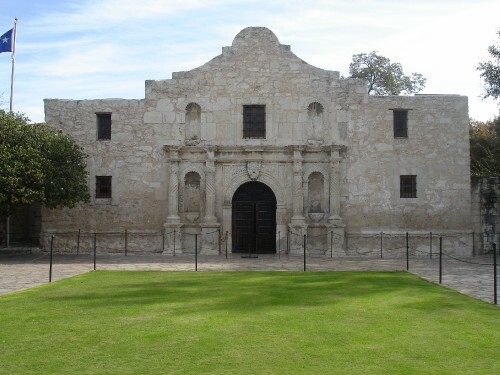 I hadimagesof the Alamo being out in the desert but it is actually in downtown San Antonio. It was ok but not exactly awe inspiring. Visited market square which has a mexican flavour and had dinner, huge tex mex meal. San Antyoniohas something called the river walk, couldn't figureoutif it was actually a river or just a canal but it was very prretty and the highlight of the city. Had a chance to relax and read a book at an outdoors theatre on the river. Had to get up to catch the greyhound to El Paso at 6am today. It was a 10 hour trip but flew by. We plan to cross into Mexico tonight which is apparently easy todo,Juarez is just across the border within walking distanceorso we have heard. The landscape on the way herewas quite barren, bordering on desert,but pretty nonetheless. El Paso is really just a stop over,we head to Alberqurque tomorrown in New Mexico which is suppossed to be quite nice. Thanksfor the offer Mum, doing fine in terms ofcash at the moment. Glad you are enjoying your new job, hope all is well with everyone ast home. Nice to hear Paul is getting on ok, he derserves it.